Joe Lauria is editor-in-chief of Consortium News and a former correspondent for The Wall Street Journal, Boston Globe, Sunday Times of London and numerous other newspapers. This is his take on the Former U.N. chief Kofi Annan who died on Saturday – writing for The Boston Globe on Dec. 29, 2006. UNITED NATIONS Dec 29, 2006: — Kofi Annan, the first United Nations secretary general from sub-Saharan Africa, ends his 10-year term on Sunday, leaving behind a complex legacy during an era of genocide, terrorism, and US dominance. Annan’s relationship with Washington most pointedly shaped his tenure as secretary-general. If he drew too close to the United States, such as on UN reform, developing nations blasted him; when he opposed the United States, such as on Iraq, trade, and development assistance, he was pilloried, especially in Congress. At first, Annan denied to investigators ever meeting with the Cotecna president. When presented with evidence of the meetings, he said they had nothing to do with his son or the contract. Three months after the final meeting Cotenca got the $10 million deal. Some Annan supporters concede that there was at least an appearance of a conflict of interest. 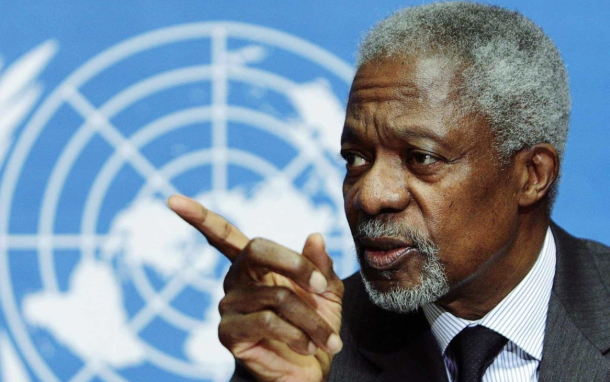 Adam Lebor, the author of a new book about the United Nations and genocide, says Annan was bound by the United Nations’ principle of strict neutrality and the charter’s prohibition against the United Nations interfering in a nation’s internal affairs. But “guilt” over Srebrenica and Rwanda has led Annan to now back military intervention to stop genocide, Lebor said. In his defence, Annan said at his final press conference that he was made the scapegoat for all the world’s problems. Joe Lauria is editor-in-chief of Consortium News and a former correspondent for The Wall Street Journal, Boston Globe, Sunday Times of London and numerous other newspapers.